Do you want to be part of something bigger than your own circle? Do you want to be a part of what could be the most memorable weekend of your life? Do you want to know more about being Dominican? Do you want to meet new friends and learn about being a follower of St. Dominic? 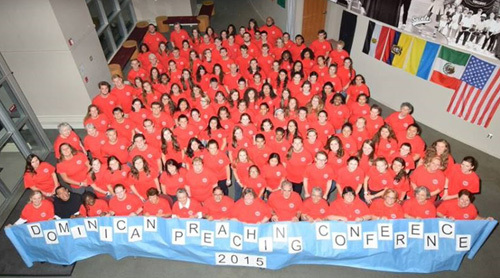 Then be a part of the Dominican High Schools Preaching Conference! Dominicans share their faith by preaching. We preach through words, arts, music and action. We preach not only by what we say and how we live, but also by who we are. Dominicans have been practicing the art of preaching for over 800 years with their founder St. Dominic. Learn how to be a Dominican preacher! Meet other students, put faith into action and have fun! Join us for the Dominican High Schools Preaching Conference! Come experience Dominic's dream; and our dream. It's fun, challenging and will change your life. Make the world a better place through your preaching! Reflect on the "Signs of the Times"
with members of the Dominican Family. To learn more about the world wide Dominican Family, visit DomLife.org. Dominicans have been living and sharing the message of the Gospel. associates, and laity serve in more than 100 countries around the globe.